Hard To Grip tells the story of a young man’s body giving out when he needs it most. It chronicles an ascending sports career, the ups and downs of life in the NCAA, and the challenges of letting go of pro baseball due to a dehumanizing condition. 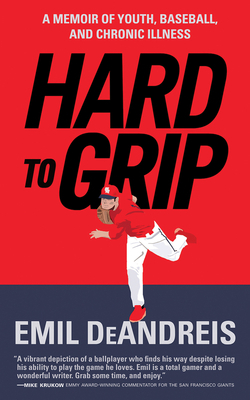 In a series of humorous anecdotes, Emil takes the reader on his bittersweet journey of a young man’s having to grapple with an “old woman’s disease.” From striking out future major leaguer All Stars, to sitting in support groups; from breaking university records, to barely making it up the stairs; from language barriers with Chinese healers to figuring out how to be employed as a vegetable, this book unveils the disease with humor and fearless honesty through the eyes of an unlikely victim. This memoir is an honest, rueful and at times hilarious story about learning to come to terms with a new reality, and an inspiring account of how Emil learned to run with the disease and not from it. Emil DeAndreis is the author of Beyond Folly (Blue Cubicle Press). He is a high school baseball coach, and he teaches English at College of San Mateo. He lives in San Francisco with his wife.